As we wait to see whether Republicans have successfully convinced each other that it’s a good idea to kill their constituents, let’s take a quick break to enjoy moderate Republican Sen. Susan Collins caught on a hot mic burning the hell out of the Trump administration—and also Rep. Blake Farenthold (R-Tex. ), of whom she said: “I don’t mean to be unkind, but he’s so unattractive it’s unbelievable.” That, friends, is a good sentence. After Reed praises Collins’s handling of the hearing, held by the Transportation, Housing and Urban Development, and Related Agencies subcommittee of the Senate Appropriations Committee, she laments the administration’s handling of spending. 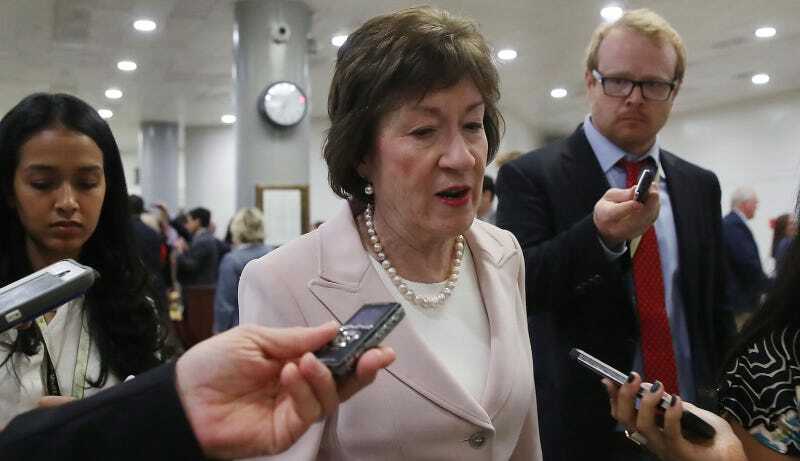 After Reed referenced “crazy people in the House,” Collins asked: “Did you see the one who challenged me to a duel?” She was referring, of course, to Rep. Farenthold, who blamed three “female senators from the Northeast” for undermining the Republican healthcare bill. Farenthold, for additional context, is also known for having once owned the website domain Blow-me.org.